In the world of blogging most times those who work hard to create the best contents aren’t really the ones who earn more. There is a difference between working hard and working smart according to the author of shoutmeloud, Harsh Agrawal. In my own case I advise bloggers who wants to earn a living from blogging to work hard and smart at the same time because you can only become successful when you find the central point between these two factors. 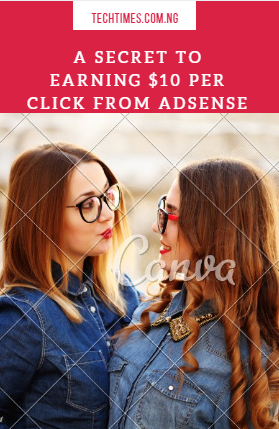 If you are an adsense publisher, then you must work very hard to produce quality contents that will enable you increase your earnings through clicks. When I started blogging my CTR percent was very high but I end up getting a few dollars from those clicks. You can imagine how frustrating that could be right? How would you feel when your estimated earnings stand at $0.8 dollars from 30 daily clicks? Your answer is as good as mine! Awful! Right? But the truth is this is not your fault and you are not entirely responsible for this. The main cause of your low earnings is closely tied to low CPC (cost per click), but the reality is often times we don’t pay attention to the simple tricks that would make us earn high from Google Adsense. That’s why in this article I am going to tell you how you can increase your CPC after a thorough research and chats with top tech bloggers. Now just sit back and relax as I walk you through these simple steps on how to increase your adsense earnings. Before we go further I would like to inform you that Google doesn’t pay an average amount for clicks, no! CPC are always content related (Keywords). Isn’t it so funny that you earn $5 per click at some point while at another time you earn $0.05? This is entirely dependent on the ads your site visitors click; if they click on ads with high paying keywords you get a good payment. High paying keywords are keywords on your blog content that has high CPC that advertises are bidding for to appear on a publisher’s website. So the more high CPC-keywords on your blog, the more money you can earn from Google Adsense. The next question on your mind now is; which are the high paying keywords? Right? Now before I tell you how to get these high paying CPC-keywords I would like to tell you that the more targeted traffic your blog receives, the more money you will make. You may find these high CPC-keywords but you still may not see significant increase on your Adsense earnings because for earnings to increase you must search for the high paying targeted keywords that will generate more traffic to your blog. If advertisers are not bidding for ads showing on your blog your CPC will always be low. Now let me give you an illustration, the highest paying keywords are; insurance, law, Donation, Loans, Hosting etc. But how can you earn from these keywords when they are not related to your blogging niche? Even if you are an insurance or donation writer do you think you can rank on these keywords when there are other big blogs out there? Now let me introduce you to SEMrush, a tool that will help you analyse your domain and help you find targeted and high paying CPC. This tool will help you find the high CPC-keywords your blog is ranking for and will help you find their charts and graphical details. The tool shows you the graphical representation of search volume, trends, number of search results etc. To get SEMrush to analyse your domain, just visit SEMrush and enter your domain and you will find out how great SEMrush works. Below is the statistical data of my blog. Now let me show you how you can increase your adsense earnings with this great tool by finding high paying CPC-keywords. But before we go further, go and create a SEMrush account and get a list of authority blogs that is related to your blogging niche. Now click “view full report” from “TOP KEYWORDS” and SEMrush will display the keywords that are driving traffic to your domain. Now to get the High CPC keywords, you have to click on the CPC tab. When you do this you will discover that most of the high CPC-keywords are long tail keywords. Now start copying the high CPC keywords that are related to your blogging niche because these are your valuables. When you are done copying these keywords, the next thing is to write blog posts related to them. Please ensure you create a well doctored content around these keywords. I sincerely hope with this article you will find high paying CPC related keywords and stat earning high revenue from Google Adsense.